The U.S. government on Monday partially released the formerly-classified Department of Justice "drone memo," dated 2010, in which Obama administration lawyers argue they have the right to extra-judicially kill U.S. citizen Anwar al-Aulaqi in Yemen. Anwar Al Aulaqi, who had been placed on a "kill list," died by U.S. drone strikes in September 2011, along with Samir Khan, as well as three other people. Just weeks later, another U.S. drone attack on a restaurant in Yemen killed Anwar Al-Aulaqi's son Abdulrahman, also a U.S. citizen, and six other civilians. Yet the drone memo was redacted before release, leading to the omission of key information, including alleged factual evidence for the government's claim that al-Aulaqi posed a threat to the United States. Barron claims the killing is justified by the 2001 Authorization for Use of Military Force—a highly controversial and expansive congressional act that has been expansively interpreted by the Bush and Obama administrations to authorize ongoing war and occupation in Afghanistan, covert drone wars in Pakistan, Yemen, and Somalia, military intervention in countries from Ethiopia to Iraq, indefinite detentions at Guantanamo Bay and Bagram prison, and more. "We believe that the AUMF's authority to use lethal force abroad also may apply in appropriate circumstances to a United States citizen who is part of the forces of an enemy authorization within the scope of the force authorization," states the memo. Center for Constitutional Rights Senior Attorney Pardiss Kebriaei, who was CCR’s lead counsel on two lawsuits with the ACLU challenging the killing of Al-Aulaqi, declared in a statement, "The DOJ memo confirms that the government’s drone killing program is built on gross distortions of law. This forced transparency comes years late, long after the memo was drafted and used to justify the premeditated killing of a U.S. citizen without trial and far from any battlefield." She adds, "The United States loosening and redefining international rules governing the use of force and war is ultimately not going to make anyone any safer." The memo notes that the CIA had an "operational role" in the targeted killing of al-Aulaqi. According to Brett Max Kaufman, Legal Fellow of the ACLU National Security Project, "[T]he official unveiling of this fact should open the door to further disclosures about the CIA's role in the program and about factual information, like numbers of civilian casualties caused by the program, that the government continues to maintain cannot be disclosed to the public." The Obama administration has for years fought the release of the document but was forced to make it public in response to Freedom of Information Act lawsuits by the American Civil Liberties Union and The New York Times. 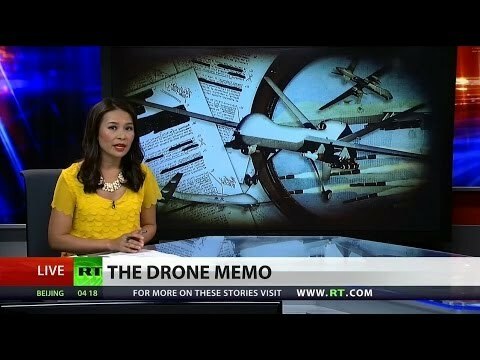 "The US drone wars have now been going on for over a decade, have killed thousands of individuals,—including a handful of American citizens, and serves as the cornerstone of President Obama's 'light footprint' national security policy," said Stephen Miles of Win Without War in an interview with Common Dreams. "The American people—in whose name these strikes occur—have a right to know far, far more about this program than they currently do." "We will continue to press for the release of other documents relating to the targeted-killing program, including other legal memos and documents relating to civilian casualties," said ACLU Deputy Legal Director Jameel Jaffer.